Eden read The Art of Gathering: How We Meet and Why It Matters by Priya Parker and reflected on how she could be more intentional in the way she designs her gatherings. 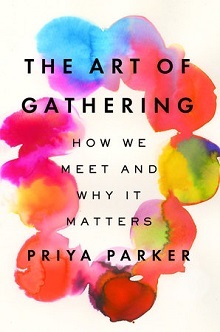 My favorite book that I’ve read so far this year is The Art of Gathering: How We Meet and Why It Matters by Priya Parker. Parker is a professional facilitator, mediator, and fellow UVA grad. Rachel recommended her book to me because she echoes much of Allison Partners’ philosophy when it comes to designing meetings. In just the first chapter, I appreciated the way that Parker challenged me to rethink the why behind many of my meetings. She believes that the purpose of your meeting should be at the center of every decision you make as you plan and design your gathering. The meeting that I decided to think about was the women’s community group that I co-lead at my church. On the surface, the question “Why lead a community group?” might seem obvious. But I took Parker’s advice and asked myself “Why?” until I found a deeper, specific, and choiceful purpose. My co-leader and I discussed our purpose early on in the semester and it boiled down to this: To provide an inviting, comfortable, and fun environment for women seeking community within our church. We follow a fairly common meeting template for small groups, but having a specific purpose for meeting helped us to make decisions down the road. The list below summarizes a few of the decisions and tradeoffs that we made with this purpose in mind. Most community groups I’ve been a part of have between eight and twelve regular members. My group has twenty-four registered members, and most women who express interest in joining our group end up bringing a friend or roommate. If we had decided that the purpose of our group was to create deep friendships and foster vulnerability, we might have decided to close our group to new members several weeks ago. Our purpose also informed our study plan. We keep our discussions more casual and open-ended each week so that late-joiners don’t feel left out. In fact, we spend most of our discussion time asking everyone their “high, low, buffalo” from the week (something good, something bad, and something awkward that happened). We don’t have much flexibility when it comes to meeting space. We usually meet in one member’s house, and this space is not quite big enough for our current number of members to spread out comfortably in the living room. However, rather than let our meeting space dictate group size, those of us who know each other cozy up and make sure that any new members have a place to join the circle. If needed, we can always push the couch against the wall to make more room. Feeding twenty women costs more than feeding ten. We keep our snacks pretty simple to make sure that we have enough for everyone who walks through the door. It’s easy for me to imagine changes that we could make to improve different aspects of our meetings. However, these changes wouldn’t align with our purpose. We’re okay with all of these tradeoffs because keeping our group open means that no one will be turned away and our intention is to be welcoming and foster connection. I am thankful that my co-leader and I are on the same page when it comes to our meeting’s purpose. However, I can think of a handful of other groups and teams I’ve been a part of where the “why” of the gathering either hasn’t been defined or isn’t in alignment among decision-makers. Think back to the meeting or gathering that you chose. Are you able to define your purpose? Does this purpose help you make decisions about different tradeoffs? Lastly, is your purpose clear among your fellow decision-makers? I’ve touched on the first chapter, but throughout her book, Parker takes the reader from what to why, and then from why to how. I highly recommend reading The Art of Gathering if you need help answering any of these questions for yourself.